In what must be a ruthless fundraising environment for solar firms, Skyline Solar received an undisclosed funding amount from Firsthand Technology Value Fund. The Mountain View, Calif.-based company has spent its first few years promoting a unique low-concentration photovoltaic (CPV) system that combined silicon solar cells and aluminum reflectors. The portfolio manager at the publicly traded investment firm, Kevin Landis, was quoted as saying, "Cost is everything when it comes to solar." 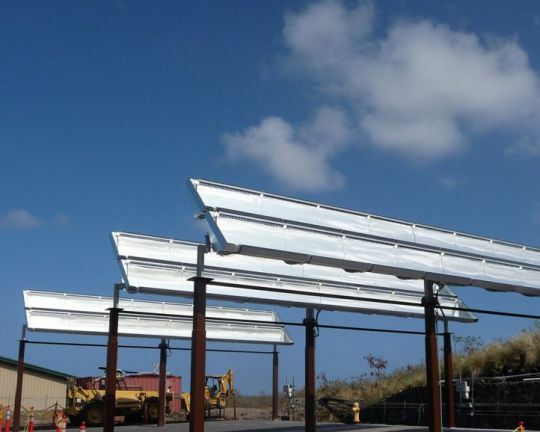 Skyline claims it can provide electricity well below 10 cents per kilowatt-hour. Skyline's original design used aluminum reflectors, aluminum being hardy and cheap as well as being sourced from an auto parts manufacturer in Mexico. The system uses silicon solar cells, not exotic III-V components. Recently, Skyline replaced the old system with the X14, which employs mirrors. Mirrors, helped by growth in the solar thermal industry, had come down enough in price to justify the swap, says Tim Keating, VP of marketing and field operations at Skyline. Skyline is being deployed on what will be the largest CPV plant in Latin America, located in Durango, Mexico and totaling 500 kilowatts. The startup has also been selected by the U.S. Department of Defense for the installation of systems at two U.S. military bases. And the firm recently announced that their X14 CPV System has been listed as an eligible project by the California Energy Commission (CEC). The switch from aluminum to mirrors allowed Skyline to reduce the number of reflectors and solar panels by 50 percent. Perhaps more importantly, doubling the length of the reflector module slashes the required in-field labor. Instead of installing 20 pre-built modules in a row, developers only have to install 10 to cover the same amount of real estate. By 2012, labor and other balance-of-system costs will likely surpass modules as the most expensive part of a solar installation. Skyline does have the benefit of riding the silicon cell cost curve down as the price of that commodity continues to plunge. But the firm has the challenge of being the author of a unique, single-sourced design from a VC-funded early-stage startup. NEA is a previous investor in the low-concentration PV system vendor. A few weeks ago, in one of Solar Power International's busiest booths, SunPower (NASDAQ: SPWRA, SPWRB) unveiled its low-concentration PV product. SunPower actually began as a concentrator company back in 1985. SunPower claims their C7 Tracker has up to a 20 percent lower levelized cost of electricity (LCOE) than competing technologies. SunPower did not clarify whether those competing technologies were other low-concentration PV (LCPV) devices, fixed flat-plate solar panels or panels on trackers. The firm did maintain that the C7 tracker provides "the lowest levelized cost of electricity (LCOE) for utility-scale solar power plants available today." SunPower said that "a 400-megawatt C7 Tracker power plant requires less than 70 megawatts of SunPower solar cells." This assembly is a seven-sun concentrator using a single-axis tracking technology with rows of parabolic mirrors. 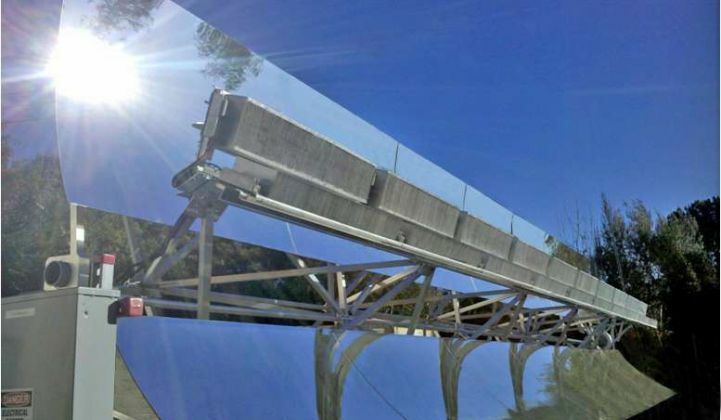 The concentrator would effectively allow the company to increase the power output of its utility-scale solar plants at a time when gaining efficiency the old-fashioned way is becoming more challenging. SunPower will soon mass-produce monocrystalline solar cells with an efficiency rating of over 23 percent, and the company has demonstrated new cells in the lab that can hit 24 percent.